Here are three things to consider when purchasing a commercial awning. 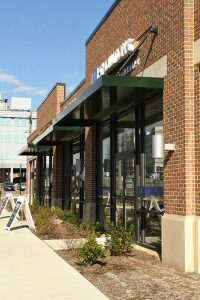 If you’ve been considering adding an awning to your commercial building now may be a perfect time. Awnings are a significant investment as they offer a lot of benefits including marketing advantages, appearance boosts, the potential for additional space and interest, and they can help reduce indoor heating and cooling costs. Often, the cost of installing an awning is recouped very quickly, making it a significant investment, particularly for restaurants. That said, finding the right awning for your business can be tricky. There are several things you will want to consider before you make a purchase. When you’re looking at the quality aspects of different types of awnings, there are several factors you can take into consideration. The potential additions like UV resistance, waterproofing, breathability, and size can all have an impact on the overall lasting quality and the price of your future awning. As you consider your options, think about what features will be most important to you and your business before making a final choice. For instance, if your awning will get a lot of sun UV protection may be of increased importance, while if you live in an area with a lot of rain, you may be more focused on waterproofing. Perhaps the most critical aspect to consider as you compare awning options merely is what will look best for your business. Having a high quality and durable awning is essential, but if the end result doesn’t look good, you’ve lost much of the potential. Awnings offer your business the opportunity to stand out and gain a decorative feature; it’s best to use this to its full potential.